The Good Friday/Belfast Agreement, signed 21 years ago by almost all parties in Northern Ireland, is an international agreement between two sovereign governments, lodged with the United Nations and recognised by the European Union. To meet these undertakings, Westminster passed the Northern Ireland Act, 1998. This Act specifically states that "Northern Ireland in its entirety remains part of the United Kingdom and shall not cease to be without the consent of a majority of the people in Northern Ireland voting in a poll…" Furthermore, it states that Northern Ireland can leave the United Kingdom "and form part of a united Ireland". In that event, proposals "as may be agreed" between the British and Irish governments shall be laid before parliament in Westminster to give effect to that wish. In the Republic, the Constitution of Ireland was amended. A new Article 3 recognises "that a united Ireland shall be brought about only by peaceful means with the consent of a majority of the people, democratically expressed, in both jurisdictions in the island". There can be no slippery slope or backdoor unification of Ireland. 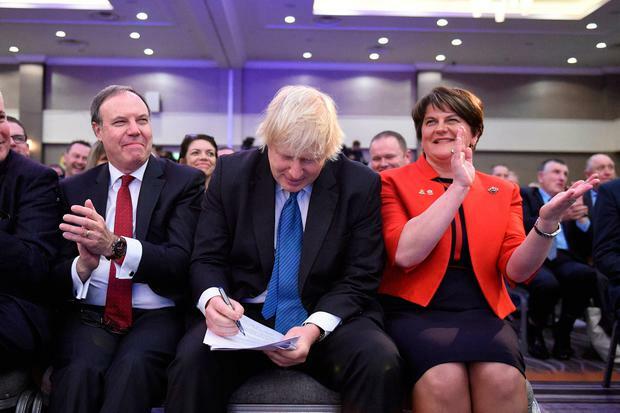 Even if the British government could abandon Northern Ireland, it could not push it into a united Ireland without the agreement of the Irish Government. The Irish Government is bound by the Constitution and could not enter into such a destructive arrangement, even if it wanted to, without the consent of a majority in both jurisdictions. It is, therefore, reckless of the DUP to fire people up by peddling deceitful nonsense about dangers to Northern Ireland's position within the UK because of the so-called backstop agreement between the UK and the EU. Goods and services are traded on the island of Ireland at present without restriction because the UK and Ireland have the same EU standards. If the UK was to leave the EU without a comprehensive deal on future access to each other's markets, including customs arrangements, only then would the backstop come into play. In simple terms, this would then mean that services and goods developed in Northern Ireland would have to meet standards "aligned to" EU rules, if exported to any part of the EU. Northern Ireland would remain within the UK and its market, moreover it would have full access to the market in the Republic and all of the rest of the EU. Separately, every person born in Northern Ireland, under the provisions of Article 2 of the Constitution, may claim Irish citizenship, should they wish, without any requirement to renounce British citizenship. They can continue to hold a British passport and have an Irish one as well, thereby conferring on them all the rights and benefits of EU citizenship. In just over a decade, total trade between the Republic and Northern Ireland doubled to €3bn in 2005. In 1993, Britain was the main market for Northern Irish outbound goods, 54.5pc as against 10.6pc to the Republic. In 2015, the Republic accounted for 61pc of Northern Ireland's exports to the EU and 34pc of its total exports, which by then had also grown exponentially. The trend continues upwards, facilitated by both Northern Ireland and the Republic being within the same regulatory environment. The backstop, if it ever came into play, would guarantee Northern Ireland's ability to continue that upward trend while maintaining its constitutional position within, and relationship with, the UK. In terms of trade, travel and citizenship, Northern Ireland can have its cake and eat it. This is the prize the DUP is thumbing its nose at, against the wishes of a majority in Northern Ireland. Its game-playing could turn the North's economy from a silk purse to a sow's ear. The backstop would present no challenge to the constitutional and legal status of Northern Ireland. However, without an alignment to EU rules of some binding form, the constitutional position of the Republic, whose citizens have voted time and again to insert EU Treaty arrangements into the Constitution, could be undermined. If Northern Ireland continued to send goods and services to the Republic, without an alignment of standards, and via the Republic to other EU countries, checks on goods and services leaving the Republic for other EU countries could follow. This is not some fanciful theory. Goods and services which are initiated on one side of the Border at present are routinely brought to a finished state on the other side. If such goods and services do not meet EU-wide standards, they cannot be freely traded within the EU. If we allowed the standard of our exports to be diluted in any way, our full access to EU markets would be in question. The backstop is an option that would come into play only if no other way can be found that meets the need. In those circumstances, it would be no weight to carry and should prove hugely beneficial to Northern Ireland. Nor are different regulatory requirements without precedent in the UK, eg Scotland has a different legal code to England. For the Republic, ensuring everything we export is accepted without question as meeting EU standards is a requirement, not an option. There can be no weakening of these standards. Because EU treaty arrangements form part of our basic law, this is a constitutional imperative, not a choice.